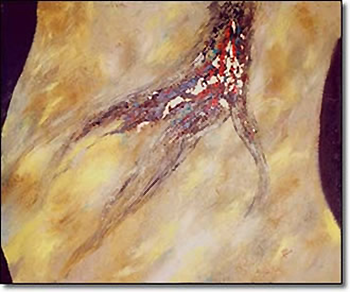 Joan accepts commissions for paintings to match your requirements. You select the theme, the colors, and the size of the painting you desire. After consulting with you, she will create the painting you are looking for. 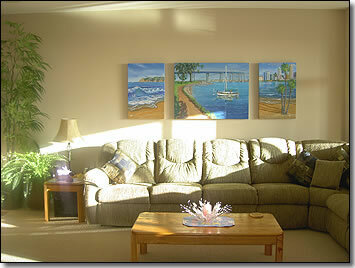 Here are some examples of commissioned paintings she has completed, along with her commentary. 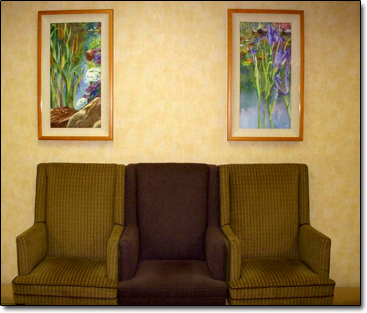 Artist's Comments: My collectors purchased Relaxing Afternoon and decided they needed a larger image for their expansive wall area. To expand their view of San Diego I painted View to Pt. Loma, on the left, and San Diego Skyline, on the right, to create this triptych. Artist's Comments: This collector's living room has vaulted ceilings. A beautiful baby grand piano adds to the ambiance of the room. 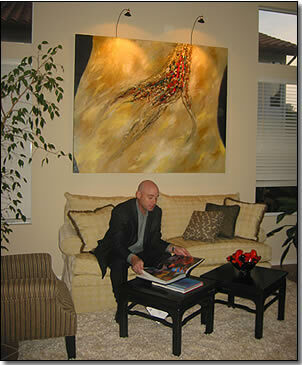 I was commissioned to create an abstract painting to coordinate with the color palette of his home. This large-scale painting is 5' x 6' and is composed of organic lines, subtle warm tones, and sparkles of gold leaf among the passages of red, black and turquoises textural brush strokes. 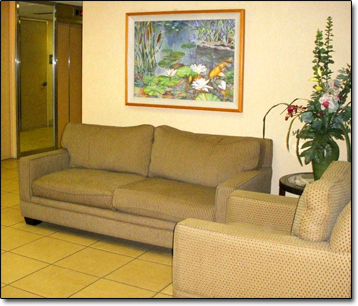 Artist's Comments: I collaborated with the interior designer on this project to create four original paintings for this medical building lobby. In addition, the company selected my limited edition and open edition prints for all of the public areas in this five-story building. 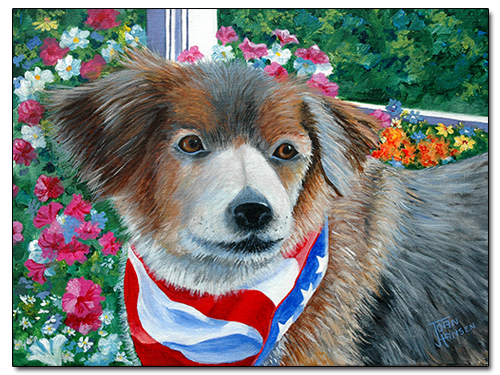 Joan has been commissioned to paint animals, floral scenes, and landscapes for her collectors. When visiting friends in Vancouver, WA, Joan met Mr. C J. He was looking adoringly at his friend while he grilled steaks for dinner. 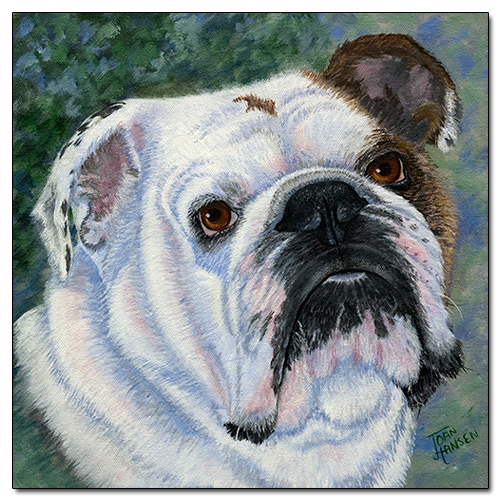 Rosco, on the right, is a beautiful bulldog who belongs to friends of the artist.